Mustang "These Horses Gotta Run!" T-shirt colour: Available in Charcoal Only. 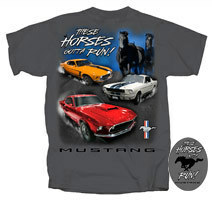 T-shirt artwork configuration: We have three variants of Mustang Muscle starting from the Yellow Blaze 1970 Boss302 fastback, the gorgeous 1965 GT350 in ‘Wimbledon White with Guardsman Blue’ hue and lastly this stunning ‘Candy Apple Red’ 1969 Boss 429 monster. The background images are in a ‘ghost’ appearance and appear as running horses. with the silhouette of the ‘Running Horse’ and same style script font located on the front left of chest. This product is officially FORD licensed. A very collectable piece for any Mustang enthusiast throughout the muscle car era!